For a while, it seemed the video gaming sector could never lose. The industry has seen substantial growth for a number of years, and games and esports analytics firm Newzoo said last year that it expects the global consumer games market to grow at a compounded annual growth rate of 10.3 percent from 2017 to 2021, reaching nearly $180 billion by 2021. In theory, that should boost companies associated with this sector. But a trio of big names in gaming—Activision Blizzard, Electronic Arts and Take-Two Interactive Software—saw sharp sell-offs in their stocks during last year’s fourth quarter. That quarter was lousy for most equities, but those three gaming companies suffered particularly awful losses ranging from 25 percent to 43 percent. They’ve since rebounded, but the downturn left some lingering questions about how industry stalwarts will fare in an era where the most popular video game is free to download and play – Fortnite, by privately held Epic Games. 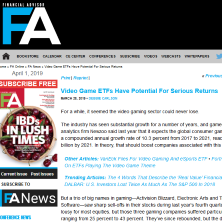 The two video game exchange-traded funds, the VanEck Vectors Video Gaming and eSports ETF (ESPO) and ETFMG Video Game Tech ETF (GAMR), were pummeled during the fourth quarter, but both are up by double-digit amounts in the first quarter. Given the price retreat in the big names, should long-term investors hit pause or replay on these ETFs?